Today we are interviewing Rolando Gayo, author of the Christian Living book "For This Reason He Came." Rolando Gayo and his wife, Jill, are very versatile musicians who love to worship the Lord and teach people to mature in Christ. 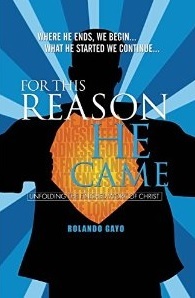 Rolando Gayo is the author of this book, "For This Reason He Came". He committed himself to knowing the will of God for his life and there are a number of reasons the Lord is using him to touch thousands of lives. He is now devoting himself in spreading the good news of living and walking in righteousness. Roland and Jill have one child, Ghale Jillian. For This Reason He Came is a compilation of truth, revelation and information of what Believers needs to know about Christian living. It has 27 wonderful topics which starts from the beginning of time to the coming of Jesus Christ. I wrote this book because I was seeking for a greater knowledge of the intentions and ultimate plans of God for mankind. The book illustrate most of the process of what Christian life is all about. If you are looking for a book that will help you grow in your Christian walk then this book is for you. What inspired you to write a book about what Believers need to know about Christian living? THE LACK OF KNOWLEDGE BEING PREACH BY TEACHERS AND PREACHERS OF THE BIBLE. Your book contains a variety topics from the start of time to the coming of Christ. How did you choose which topics to include? I HAVE MORE THAN 50 TOPICS WHEN I STARTED TO THINK ABOUT WRITING BUT MY GOAL IS TO ILLUSTRATE AND SHOW WHAT’S THE PURPOSE OF GOD FOR MAN. AND SO I PICKED WHAT’S APPROPRIATE IN OUR CHRISTIAN LIVING NOW. What are some of the things you learned while doing research for this book? I HAVE LEARNED THAT GOD HAS A SPECIFIC PURPOSE WHY HE CREATED MAN AND THAT SHOULD BE OUR FOCUSED IN OUR LIVING. I BELIEVE PEOPLE WILL HAVE THE UNDERSTANDING WHAT’S THE ULTIMATE PLAN OF GOD FOR MANKIND. THAT THIS BOOK WILL CHALLENGED THEIR CHRISTIAN WALK AND FOCUS ON WHAT IS THE WILL OF GOD FOR THEIR LIVES.